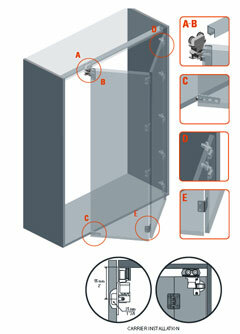 Folding system for doors installed overlay the opening. Ideal for closet applications. Includes Euro hinges to fix the door to the lateral. Aluminium track allows a smooth, silent performance and easy installation. Door overlay the closet, hiding the track, with no need for fascia. The system can be applied to right or left door.led one on top of the other.